Director: Prof Heather Zar, Contact: heather.zar@uct.ac.za, Tel: 27-21-658-5318. The MRC Unit on Child and Adolescent Health focuses on key health concerns affecting children and adolescents in South Africa and in Africa. A primary focus is on child lung health and the intersection of infection with emergence of chronic non-communicable diseases, addressing lung health from birth through adolescence. Studies focus on the epidemiology, aetiology and risk factors for acute and chronic lung disease and the impact of acute disease on child health and on development of chronic disease. Research encompasses a broad range of methodologies from epidemiology to clinical science to laboratory-based methods. The DCHS is a multi-year birth cohort study following 1,000 mother child pairs. The purpose of the study is to investigate the epidemiology, etiology and risk factors for childhood lower respiratory illness and the impact on child health, particularly the development of chronic respiratory disease. The study aims to investigate the role and interaction of potential risk factors covering 7 areas (environmental, infectious, nutritional, genetic, psychosocial, maternal and immunological) that may impact child health. Mothers are enrolled at 20-28 weeks gestation and children are followed until they reach at least five years of age. This approach will provide an innovative, longitudinal assessment of a range of clinical, molecular, environmental and socioeconomic variables impacting child health and the evolution of chronic disease in a low- and middle-income country setting. CTAAC aims investigate markers of chronic disease processes and progression in perinatally HIV-infected SA adolescents, between the ages of 9 -14 years, focusing in five key areas (general adolescent development; neurocognitive function; pulmonary disease; cardiovascular function; and musculoskeletal disease). The study is an ongoing prospective cohort study of adolescents recruited from Nolungile Community Health Centre (CHC), Mitchell’s Plain CHC, Hannan Crusaid Treatment Centre, Crossroads CHC, Groote Schuur Hospital, Tygerberg Hospital and Red Cross War Memorial Children’s Hospital; HIV-uninfected controls were enrolled from Masiphumelele Youth Centre, Cape Town. The MRC TB-CHILD network aims to establish a platform for paediatric TB translational research between Red Cross War Memorial Children’s Hospital (University of Cape Town) and peadiatric departments in the E astern Cape, affiliated with Walter Sisulu University. Concurrent to the ongoing capacity development at the Eastern Cape sites, a TB diagnostic study is currently underway at our unit. The aim is to extend this study across the TB-CHILD Network sites. This study aims to improve diagnosis of paediatric TB by establishing the diagnostic value (sensitivity and sensitivity) of novel tests on different specimens. A prospective cohort study for strengthening diagnosis of paediatric TB. We aim to enroll 450 children with suspected TB over a three-year period. Enrolment is due to commence in October 2016. The aim of the study is to develop improved diagnostic strategies for TB in children by improving rapid diagnosis (within 1 day) of TB disease in children by investigating the sensitivity and specificity of GeneXpert Ultra. A phase 3, randomized, placebo-controlled trial to determine the immunogenicity and safety of a Respiratory Syncytial Virus (RSV) F Nanoparticle Vaccine with Aluminum in healthy third-trimester pregnant women; and safety and efficacy of maternally transferred antibodies in preventing RSV disease in their infants will be initiated in 2016 as part of a multi-centre study. We aim to enroll 150 pregnant women over a 1-year period for up to 3 years. Enrolment for this study will commence in October 2016. Amlabu V, Mulligan C, Jele N, Evans A, Gray D, Zar HJ, McIlleron H, Smith P. Isoniazid/acetylisoniazid urine concentrations: markers of adherence to isoniazid preventive therapy in children. Int J Tuberc Lung Dis. 2014 May;18(5):528-30. doi: 10.5588/ijtld.13.0730. Balme KH, Zar H, Swift DK, Mann MD. The efficacy of prophylactic antibiotics in the management of children with kerosene-associated pneumonitis: a double-blind randomised controlled trial. Clin Toxicol (Phila). 2015;53(8):789-96. doi: 10.3109/15563650.2015.1059943. Epub 2015 Jun 26. Basera W, Botha M, Gray CL, Lunjani N, Watkins AS, Venter C, Allen KJ, Hlela C, Zar HJ, Levin ME. The South African Food Sensitisation and Food Allergy population-based study of IgE-mediated food allergy: validity, safety, and acceptability. Ann Allergy Asthma Immunol. 2015 Aug;115(2):113-9. doi: 10.1016/j.anai.2015.06.003. Epub 2015 Jun 20. Beran D, Zar HJ, Perrin C, Menezes AM, Burney P; Forum of International Respiratory Societies working group collaboration. Burden of asthma and chronic obstructive pulmonary disease and access to essential medicines in low-income and middle-income countries. Lancet Respir Med. 2015 Feb;3(2):159-70. doi: 10.1016/S2213-2600(15)00004-1. Review. European Innovation Partnership on Active and Healthy Ageing, Action Plan B3; Mechanisms of the Development of Allergy, WP 10; Global Alliance against Chronic Respiratory Diseases, Bousquet J, Addis A, Adcock I, Agache I, Agusti A, Alonso A, Annesi-Maesano I, Anto JM, Bachert C, Baena-Cagnani CE, Bai C, Baigenzhin A, Barbara C, Barnes PJ, Bateman ED, Beck L, Bedbrook A, Bel EH, Benezet O, Bennoor KS, Benson M, Bernabeu-Wittel M, Bewick M, Bindslev-Jensen C, Blain H, Blasi F, Bonini M, Bonini S, Boulet LP, Bourdin A, Bourret R, Bousquet PJ, Brightling CE, Briggs A, Brozek J, Buhl R, Bush A, Caimmi D, Calderon M, Calverley P, Camargos PA, Camuzat T, Canonica GW, Carlsen KH, Casale TB, Cazzola M, Cepeda Sarabia AM, Cesario A, Chen YZ, Chkhartishvili E, Chavannes NH, Chiron R, Chuchalin A, Chung KF, Cox L, Crooks G, Crooks MG, Cruz AA, Custovic A, Dahl R, Dahlen SE, De Blay F, Dedeu T, Deleanu D, Demoly P, Devillier P, Didier A, Dinh-Xuan AT, Djukanovic R, Dokic D, Douagui H, Dubakiene R, Eglin S, Elliot F, Emuzyte R, Fabbri L, Fink Wagner A, Fletcher M, Fokkens WJ, Fonseca J, Franco A, Frith P, Furber A, Gaga M, Garcés J, Garcia-Aymerich J, Gamkrelidze A, Gonzales-Diaz S, Gouzi F, Guzmán MA, Haahtela T, Harrison D, Hayot M, Heaney LG, Heinrich J, Hellings PW, Hooper J, Humbert M, Hyland M, Iaccarino G, Jakovenko D, Jardim JR, Jeandel C, Jenkins C, Johnston SL, Jonquet O, Joos G, Jung KS, Kalayci O, Karunanithi S, Keil T, Khaltaev N, Kolek V, Kowalski ML, Kull I, Kuna P, Kvedariene V, Le LT, Lodrup Carlsen KC, Louis R, MacNee W, Mair A, Majer I, Manning P, de Manuel Keenoy E, Masjedi MR, Melen E, Melo-Gomes E, Menzies-Gow A, Mercier G, Mercier J, Michel JP, Miculinic N, Mihaltan F, Milenkovic B, Molimard M, Momas I, Montilla-Santana A, Morais-Almeida M, Morgan M, N'Diaye M, Nafti S, Nekam K, Neou A, Nicod L, O'Hehir R, Ohta K, Paggiaro P, Palkonen S, Palmer S, Papadopoulos NG, Papi A, Passalacqua G, Pavord I, Pigearias B, Plavec D, Postma DS, Price D, Rabe KF, Radier Pontal F, Redon J, Rennard S, Roberts J, Robine JM, Roca J, Roche N, Rodenas F, Roggeri A, Rolland C, Rosado-Pinto J, Ryan D, Samolinski B, Sanchez-Borges M, Schünemann HJ, Sheikh A, Shields M, Siafakas N, Sibille Y, Similowski T, Small I, Sola-Morales O, Sooronbaev T, Stelmach R, Sterk PJ, Stiris T, Sud P, Tellier V, To T, Todo-Bom A, Triggiani M, Valenta R, Valero AL, Valiulis A, Valovirta E, Van Ganse E, Vandenplas O, Vasankari T, Vestbo J, Vezzani G, Viegi G, Visier L, Vogelmeier C, Vontetsianos T, Wagstaff R, Wahn U, Wallaert B, Whalley B, Wickman M, Williams DM, Wilson N, Yawn BP, Yiallouros PK, Yorgancioglu A, Yusuf OM, Zar HJ, Zhong N, Zidarn M, Zuberbier T. Integrated care pathways for airway diseases (AIRWAYS-ICPs). Eur Respir J. 2014 Aug;44(2):304-23. doi: 10.1183/09031936.00014614. Epub 2014 Jun 12. Brittain K, Myer L, Koen N, Koopowitz S, Donald KA, Barnett W, Zar HJ, Stein DJ. Risk Factors for Antenatal Depression and Associations with Infant Birth Outcomes: Results From a South African Birth Cohort Study. Paediatr Perinat Epidemiol. 2015 Nov;29(6):505-14. doi: 10.1111/ppe.12216. Epub 2015 Aug 3. Bélard S, Isaacs W, Black F, Bateman L, Madolo L, Munro J, Workman L, Grobusch MP, Zar HJ. Treatment of childhood tuberculosis: caregivers' practices and perceptions in Cape Town, South Africa. Paediatr Int Child Health. 2015 Feb;35(1):24-8. doi: 10.1179/2046905514Y.0000000133. Epub 2014 Jul 18. Bélard S, Andronikou S, Pillay T, Grobusch MP, Zar HJ. New imaging approaches for improving diagnosis of childhood tuberculosis. S Afr Med J. 2014 Mar;104(3):181-2. Bélard S, Heller T, Grobusch MP, Zar HJ. Point-of-care ultrasound: a simple protocol to improve diagnosis of childhood tuberculosis. Pediatr Radiol. 2014 Jun;44(6):679-80. doi: 10.1007/s00247-014-2971-7. Epub 2014 May 23. Claassen S, du Toit E, Kaba M, Moodley C, Zar HJ, Nicol MP. A comparison of the efficiency of five different commercial DNA extraction kits for extraction of DNA from faecal samples. J Microbiol Methods. 2013 Aug;94(2):103-10. doi: 10.1016/j.mimet.2013.05.008. Epub 2013 May 14. Djawe K, Daly KR, Levin L, Zar HJ, Walzer PD. Humoral immune responses to Pneumocystis jirovecii antigens in HIV-infected and uninfected young children with pneumocystis pneumonia. PLoS One. 2013 Dec 26;8(12):e82783. doi: 10.1371/journal.pone.0082783. eCollection 2013. Donald KA, Ipser JC, Howells FM, Roos A, Fouche JP, Riley EP, Koen N, Woods RP, Biswal B, Zar HJ, Narr KL, Stein DJ. Interhemispheric Functional Brain Connectivity in Neonates with Prenatal Alcohol Exposure: Preliminary Findings. Alcohol Clin Exp Res. 2016 Jan;40(1):113-21. doi: 10.1111/acer.12930. Donald KA, Fouche JP, Roos A, Koen N, Howells FM, Riley EP, Woods RP, Zar HJ, Narr KL, Stein DJ. Alcohol exposure in utero is associated with decreased gray matter volume in neonates. Metab Brain Dis. 2016 Feb;31(1):81-91. doi: 10.1007/s11011-015-9771-0. Epub 2015 Nov 29. Donald KA, Roos A, Fouche JP, Koen N, Howells FM, Woods RP, Zar HJ, Narr KL, Stein DJ. A study of the effects of prenatal alcohol exposure on white matter microstructural integrity at birth. Acta Neuropsychiatr. 2015 Aug;27(4):197-205. doi: 10.1017/neu.2015.35. Epub 2015 May 29. Dube FS, van Mens SP, Robberts L, Wolter N, Nicol P, Mafofo J, Africa S, Zar HJ, Nicol MP. Comparison of a Real-Time Multiplex PCR and Sequetyping Assay for Pneumococcal Serotyping. PLoS One. 2015 Sep 3;10(9):e0137349. doi: 10.1371/journal.pone.0137349. eCollection 2015. Dube FS, Kaba M, Whittaker E, Zar HJ, Nicol MP. Detection of Streptococcus pneumoniae from Different Types of Nasopharyngeal Swabs in Children. PLoS One. 2013 Jun 26;8(6):e68097. Print 2013. Emodi Perlman A, Lobbezoo F, Zar A, Friedman Rubin P, van Selms MK, Winocur E. Self-Reported bruxism and associated factors in Israeli adolescents. J Oral Rehabil. 2016 Jun;43(6):443-50. doi: 10.1111/joor.12391. Epub 2016 Mar 9. Frigati L, Maskew M, Workman L, Munro J, Andronikou S, Nicol MP, Zar HJ. Clinical Predictors of Culture-confirmed Pulmonary Tuberculosis in Children in a High Tuberculosis and HIV Prevalence Area. Pediatr Infect Dis J. 2015 Sep;34(9):e206-10. doi: 10.1097/INF.0000000000000792. Graham SM, Cuevas LE, Jean-Philippe P, Browning R, Casenghi M, Detjen AK, Gnanashanmugam D, Hesseling AC, Kampmann B, Mandalakas A, Marais BJ, Schito M, Spiegel HM, Starke JR, Worrell C, Zar HJ. Clinical Case Definitions for Classification of Intrathoracic Tuberculosis in Children: An Update. Clin Infect Dis. 2015 Oct 15;61Suppl 3:S179-87. doi: 10.1093/cid/civ581. Gray CL, Levin ME, Zar HJ, Potter PC, Khumalo NP, Volkwyn L, Fenemore B, du Toit G. Food allergy in South African children with atopic dermatitis. Pediatr Allergy Immunol. 2014 Oct;25(6):572-9. doi: 10.1111/pai.12270. Gray D, Willemse L, Visagie A, Smith E, Czövek D, Sly PD, Hantos Z, Hall GL, Zar HJ. Lung function and exhaled nitric oxide in healthy unsedated African infants. Respirology. 2015 Oct;20(7):1108-14. doi: 10.1111/resp.12579. Epub 2015 Jul 1. Gray D, Czövek D, Smith E, Willemse L, Alberts A, Gingl Z, Hall GL, Zar HJ, Sly PD, Hantos Z. Respiratory impedance in healthy unsedated South African infants: effects of maternal smoking. Respirology. 2015 Apr;20(3):467-73. doi:10.1111/resp.12463. Epub 2015 Jan 11. Gray DM, Willemse L, Alberts A, Simpson S, Sly PD, Hall GL, Zar HJ. Lung function in African infants: a pilot study. Pediatr Pulmonol. 2015 Jan;50(1):49-54. doi: 10.1002/ppul.22965. Epub 2013 Dec 11. Gray DM, Workman LJ, Lombard CJ, Jennings T, Innes S, Grobbelaar CJ, Cotton MF, Zar HJ. Isoniazid preventive therapy in HIV-infected children on antiretroviral therapy: a pilot study. Int J Tuberc Lung Dis. 2014 Mar;18(3):322-7. doi: 10.5588/ijtld.13.0354. Erratum in: Int J Tuberc Lung Dis. 2014 Jun;18(6):754. Groome MJ, Page N, Cortese MM, Moyes J, Zar HJ, Kapongo CN, Mulligan C, Diedericks R, Cohen C, Fleming JA, Seheri M, Mphahlele J, Walaza S, Kahn K, Chhagan M, Steele AD, Parashar UD, Zell ER, Madhi SA. Effectiveness of monovalent human rotavirus vaccine against admission to hospital for acute rotavirus diarrhoea in South African children: a case-control study. Lancet Infect Dis. 2014 Nov;14(11):1096-104. doi: 10.1016/S1473-3099(14)70940-5. Epub 2014 Oct 7. Erratum in: Lancet Infect Dis. 2014 Nov;14(11):1040. Held M, Laubscher M, Zar HJ, Dunn RN. GeneXpert polymerase chain reaction for spinal tuberculosis: an accurate and rapid diagnostic test. Bone Joint J. 2014 Oct;96-B(10):1366-9. doi: 10.1302/0301-620X.96B10.34048. Hsiao NY, Zampoli M, Morrow B, Zar HJ, Hardie D. Cytomegalovirus viraemia in HIV exposed and infected infants: prevalence and clinical utility for diagnosing CMV pneumonia. J Clin Virol. 2013 Sep;58(1):74-8. doi: 10.1016/j.jcv.2013.05.002. Epub 2013 May 31. Koen N, Brittain K, Donald KA, Barnett W, Koopowitz S, Maré K, Zar HJ, Stein DJ. Psychological trauma and posttraumatic stress disorder: risk factors and associations with birth outcomes in the Drakenstein Child Health Study. Eur J Psychotraumatol. 2016 Feb 12;7:28720. doi: 10.3402/ejpt.v7.28720. eCollection 2016. Koen N, Wyatt GE, Williams JK, Zhang M, Myer L, Zar HJ, Stein DJ. Intimate partner violence: associations with low infant birthweight in a South African birth cohort. Metab Brain Dis. 2014 Jun;29(2):281-99. doi:10.1007/s11011-014-9525-4. Epub 2014 Apr 12.
le Roux DM, Myer L, Nicol MP, Zar HJ. Incidence and severity of childhood pneumonia in the first year of life in a South African birth cohort: the Drakenstein Child Health Study. Lancet Glob Health. 2015 Feb;3(2):e95-e103. doi: 10.1016/S2214-109X(14)70360-2.
le Roux DM, Myer L, Nicol MP, Zar HJ. Incidence of childhood pneumonia: facility-based surveillance estimate compared to measured incidence in a South African birth cohort study. BMJ Open. 2015 Dec 18;5(12):e009111. doi:10.1136/bmjopen-2015-009111. Ling DI, Nicol MP, Pai M, Pienaar S, Dendukuri N, Zar HJ. Incremental value of T-SPOT.TB for diagnosis of active pulmonary tuberculosis in children in a high-burden setting: a multivariable analysis. Thorax. 2013 Sep;68(9):860-6. doi:10.1136/thoraxjnl-2012-203086. Epub 2013 May 14. Madhi SA, Groome MJ, Zar HJ, Kapongo CN, Mulligan C, Nzenze S, Moore DP, Zell ER, Whitney CG, Verani JR. Effectiveness of pneumococcal conjugate vaccine against presumed bacterial pneumonia hospitalisation in HIV-uninfected South African children: a case-control study. Thorax. 2015 Dec;70(12):1149-55. doi: 10.1136/thoraxjnl-2014-206593. Epub 2015 Jun 19. Manenzhe RI, Zar HJ, Nicol MP, Kaba M. The spread of carbapenemase-producing bacteria in Africa: a systematic review. J Antimicrob Chemother. 2015 Jan;70(1):23-40. doi: 10.1093/jac/dku356. Epub 2014 Sep 26. Review. Morrow BM, Samuel CM, Zampoli M, Whitelaw A, Zar HJ. Pneumocystis pneumonia in South African children diagnosed by molecular methods. BMC Res Notes. 2014 Jan 10;7:26. doi: 10.1186/1756-0500-7-26. Nicol MP, Gnanashanmugam D, Browning R, Click ES, Cuevas LE, Detjen A, Graham SM, Levin M, Makhene M, Nahid P, Perez-Velez CM, Reither K, Song R, Spiegel HM, Worrell C, Zar HJ, Walzl G. A Blueprint to Address Research Gaps in the Development of Biomarkers for Pediatric Tuberculosis. Clin Infect Dis. 2015 Oct 15;61Suppl 3:S164-72. doi: 10.1093/cid/civ613. Nicol MP, Allen V, Workman L, Isaacs W, Munro J, Pienaar S, Black F, Adonis L, Zemanay W, Ghebrekristos Y, Zar HJ. Urine lipoarabinomannan testing for diagnosis of pulmonary tuberculosis in children: a prospective study. Lancet Glob Health. 2014 May;2(5):e278-84. Nicol MP, Spiers K, Workman L, Isaacs W, Munro J, Black F, Zemanay W, Zar HJ. Xpert MTB/RIF testing of stool samples for the diagnosis of pulmonary tuberculosis in children. Clin Infect Dis. 2013 Aug;57(3):e18-21. doi:10.1093/cid/cit230. Epub 2013 Apr 11. Erratum in: Clin Infect Dis. 2014 Jul 1;59(1):145. Pitcher RD, Lombard CJ, Cotton MF, Beningfield SJ, Workman L, Zar HJ. Chest radiographic abnormalities in HIV-infected African children: a longitudinal study. Thorax. 2015 Sep;70(9):840-6. doi: 10.1136/thoraxjnl-2014-206105. Epub 2015 Jun9. Pitcher RD, Beningfield SJ, Zar HJ. The chest X-ray features of chronic respiratory disease in HIV-infected children--a review. Paediatr Respir Rev. 2015 Sep;16(4):258-66. doi: 10.1016/j.prrv.2015.01.005. Epub 2015 Jan 28. Pitcher RD, Lombard C, Cotton MF, Beningfield SJ, Zar HJ. Clinical and immunological correlates of chest X-ray abnormalities in HIV-infected South African children with limited access to anti-retroviral therapy. Pediatr Pulmonol. 2014 Jun;49(6):581-8. doi: 10.1002/ppul.22840. Epub 2013 Aug 22. Planting NS, Visser GL, Nicol MP, Workman L, Isaacs W, Zar HJ. Safety and efficacy of induced sputum in young children hospitalised with suspected pulmonary tuberculosis. Int J Tuberc Lung Dis. 2014 Jan;18(1):8-12. doi:10.5588/ijtld.13.0132. Putz K, Hayani K, Zar FA. Meningitis. Prim Care. 2013 Sep;40(3):707-26. doi: 10.1016/j.pop.2013.06.001. Epub 2013 Jul 25. Review. H3Africa Consortium, Rotimi C, Abayomi A, Abimiku A, Adabayeri VM, Adebamowo C, Adebiyi E, Ademola AD, Adeyemo A, Adu D, Affolabi D, Agongo G, Ajayi S, Akarolo-Anthony S, Akinyemi R, Akpalu A, Alberts M, Alonso Betancourt O, Alzohairy AM, Ameni G, Amodu O, Anabwani G, Andersen K, Arogundade F, Arulogun O, Asogun D, Bakare R, Balde N, Baniecki ML, Beiswanger C, Benkahla A, Bethke L, Boehnke M, Boima V, Brandful J, Brooks AI, Brosius FC, Brown C, Bucheton B, Burke DT, Burnett BG, Carrington-Lawrence S, Carstens N, Chisi J, Christoffels A, Cooper R, Cordell H, Crowther N, Croxton T, de Vries J, Derr L, Donkor P, Doumbia S, Duncanson A, Ekem I, El Sayed A, Engel ME, Enyaru JC, Everett D, Fadlelmola FM, Fakunle E, Fischbeck KH, Fischer A, Folarin O, Gamieldien J, Garry RF, Gaseitsiwe S, Gbadegesin R, Ghansah A, Giovanni M, Goesbeck P, Gomez-Olive FX, Grant DS, Grewal R, Guyer M, Hanchard NA, Happi CT, Hazelhurst S, Hennig BJ, Hertz- C, Fowler, Hide W, Hilderbrandt F, Hugo-Hamman C, Ibrahim ME, James R, Jaufeerally-Fakim Y, Jenkins C, Jentsch U, Jiang PP, Joloba M, Jongeneel V, Joubert F, Kader M, Kahn K, Kaleebu P, Kapiga SH, Kassim SK, Kasvosve I, Kayondo J, Keavney B, Kekitiinwa A, Khan SH, Kimmel P, King MC, Kleta R, Koffi M, Kopp J, Kretzler M, Kumuthini J, Kyobe S, Kyobutungi C, Lackland DT, Lacourciere KA, Landouré G, Lawlor R, Lehner T, Lesosky M, Levitt N, Littler K, Lombard Z, Loring JF, Lyantagaye S, Macleod A, Madden EB, Mahomva CR, Makani J, Mamven M, Marape M, Mardon G, Marshall P, Martin DP, Masiga D, Mason R, Mate-Kole M, Matovu E, Mayige M, Mayosi BM, Mbanya JC, McCurdy SA, McCarthy MI, McIlleron H, Mc'Ligeyo SO, Merle C, Mocumbi AO, Mondo C, Moran JV, Motala A, Moxey-Mims M, Mpoloka WS, Msefula CL, Mthiyane T, Mulder N, Mulugeta Gh, Mumba D, Musuku J, Nagdee M, Nash O, Ndiaye D, Nguyen AQ, Nicol M, Nkomazana O, Norris S, Nsangi B, Nyarko A, Nyirenda M, Obe E, Obiakor R, Oduro A, Ofori-Acquah SF, Ogah O, Ogendo S, Ohene-Frempong K, Ojo A, Olanrewaju T, Oli J, Osafo C, Ouwe Missi Oukem-Boyer O, Ovbiagele B, Owen A, Owolabi MO, Owolabi L, Owusu-Dabo E, Pare G, Parekh R, Patterton HG, Penno MB, Peterson J, Pieper R, Plange-Rhule J, Pollak M, Puzak J, Ramesar RS, Ramsay M, Rasooly R, Reddy S, Sabeti PC, Sagoe K, Salako T,Samassékou O, Sandhu MS, Sankoh O, Sarfo FS, Sarr M, Shaboodien G, Sidibe I, Simo G, Simuunza M, Smeeth L, Sobngwi E, Soodyall H, Sorgho H, Sow Bah O, Srinivasan S, Stein DJ, Susser ES, Swanepoel C, Tangwa G, Tareila A, Tastan Bishop O, Tayo B, Tiffin N, Tinto H, Tobin E, Tollman SM, Traoré M, Treadwell MJ, Troyer J, Tsimako-Johnstone M, Tukei V, Ulasi I, Ulenga N, van Rooyen B, Wachinou AP, Waddy SP, Wade A, Wayengera M, Whitworth J, Wideroff L, Winkler CA, Winnicki S, Wonkam A, Yewondwos M, sen T, Yozwiak N, Zar H. Research capacity. Enabling the genomic revolution in Africa. Science. 2014 Jun 20;344(6190):1346-8. doi:10.1126/science.1251546. Shi T, Balsells E, Wastnedge E, Singleton R, Rasmussen ZA, Zar HJ, Rath BA, Madhi SA, Campbell S, Vaccari LC, Bulkow LR, Thomas ED, Barnett W, Hoppe C, Campbell H, Nair H. Risk factors for respiratory syncytial virus associated with acute lower respiratory infection in children under five years: Systematic review and meta-analysis. J Glob Health. 2015 Dec;5(2):020416. doi:10.7189/jogh.05.020416. Suk WA, Ahanchian H, Asante KA, Carpenter DO, Diaz-Barriga F, Ha EH, Huo X, King M, Ruchirawat M, da Silva ER, Sly L, Sly PD, Stein RT, van den Berg M, Zar H, Landrigan PJ. Environmental Pollution: An Under-recognized Threat to Children's Health, Especially in Low- and Middle-Income Countries. Environ Health Perspect. 2016 Mar 1;124(3):A41-5. doi: 10.1289/ehp.1510517. Tran LT, Roos A, Fouche JP, Koen N, Woods RP, Zar HJ, Narr KL, Stein DJ, Donald KA. White Matter Microstructural Integrity and Neurobehavioral Outcome of HIV-Exposed Uninfected Neonates. Medicine (Baltimore). 2016 Jan;95(4):e2577. doi:10.1097/MD.0000000000002577. Vanker A, Barnett W, Nduru PM, Gie RP, Sly PD, Zar HJ. Home environment and indoor air pollution exposure in an African birth cohort study. Sci Total Environ. 2015 Dec 1;536:362-7. doi: 10.1016/j.scitotenv.2015.06.136. Epub 2015 Jul 28. Wilmshurst JM, Morrow B, du Preez A, Githanga D, Kennedy N, Zar HJ. 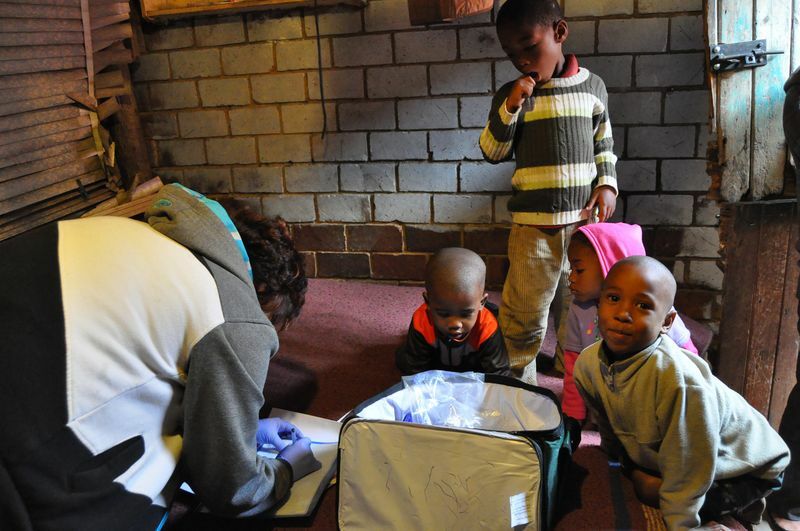 The African Pediatric Fellowship Program: Training in Africa for Africans. Pediatrics. 2016 Jan;137(1). doi: 10.1542/peds.2015-2741. Epub 2015 Dec 9. Zampoli M, Kappos A, Verwey C, Mamathuba R, Zar HJ. Impact of fibrinolytics on the outcome of empyema in South African children. S Afr Med J. 2015 Sep 21;105(7):549-53. doi: 10.7196/SAMJnew.7796. Zampoli M, Kappos A, Wolter N, von Gottberg A, Verwey C, Mamathuba R, Zar HJ. Etiology and Incidence of Pleural Empyema in South African Children. Pediatr Infect Dis J. 2015 Dec;34(12):1305-10. doi: 10.1097/INF.0000000000000880. Zar H, Green RJ, Weinberg E, Harrison VC. Max Klein, 1941-2015. S Afr Med J. 2015 Apr;105(4):254-5. Zar H, Pohunek P. Foreword: child lung health--a global priority. Pediatr Pulmonol. 2014 Sep;49 Suppl 37:S1. doi: 10.1002/ppul.23069. Zar HJ, Billo N, Ferkol T, Vestbo J. Decade of the lung--a call for action to promote lung health globally. Lancet Respir Med. 2016 Jan;4(1):e3-4. doi: 10.1016/S2213-2600(15)00505-6. Zar HJ, Barnett W, Stadler A, Gardner-Lubbe S, Myer L, Nicol MP. Aetiology of childhood pneumonia in a well vaccinated South African birth cohort: a nested case-control study of the Drakenstein Child Health Study. Lancet Respir Med. 2016 Apr 21. pii: S2213-2600(16)00096-5. doi: 10.1016/S2213-2600(16)00096-5. [Epub ahead of print]. Zar HJ, White DA, Morrow B, Feldman C, Risenga S, Masekela R, Lewis H, Jeena P, Madhi SA. The bronchiolitis season is upon us--recommendations for the management and prevention of acute viral bronchiolitis. S Afr Med J. 2015 Sep 21;105(7):525-6. doi: 10.7196/SAMJnew.8040. Zar HJ, Polack FP. Childhood pneumonia: the role of viruses. Thorax. 2015 Sep;70(9):811-2. doi: 10.1136/thoraxjnl-2015-207320. Epub 2015 Jun 19. Zar HJ, Workman LJ, Little F, Nicol MP. Diagnosis of Pulmonary Tuberculosis in Children: Assessment of the 2012 National Institutes of Health Expert Consensus Criteria. Clin Infect Dis. 2015 Oct 15;61Suppl 3:S173-8. doi:10.1093/cid/civ622. Zar HJ, Barnett W, Myer L, Stein DJ, Nicol MP. Investigating the early-life determinants of illness in Africa: the Drakenstein Child Health Study. Thorax. 2015 Jun;70(6):592-4. doi: 10.1136/thoraxjnl-2014-206242. Epub 2014 Sep 16. Zar HJ, Andronikou S. Chest X-rays for screening of paediatric PTB: child selection and standardised radiological criteria are key. Int J Tuberc Lung Dis. 2015 Dec;19(12):1411. doi: 10.5588/ijtld.15.0823. Zar HJ, Weinberg EG. Max Klein: a great man and a great paediatrician. Thorax. 2015 Apr;70(4):396-7. doi: 10.1136/thoraxjnl-2015-206947. Zar HJ, Ferkol TW. The global burden of respiratory disease-impact on child health. Pediatr Pulmonol. 2014 May;49(5):430-4. doi: 10.1002/ppul.23030. Epub 2014 Mar 9. Zar HJ, Madhi SA, Aston SJ, Gordon SB. Pneumonia in low and middle income countries: progress and challenges. Thorax. 2013 Nov;68(11):1052-6. doi: 10.1136/thoraxjnl-2013-204247. Epub 2013 Aug 16. Review. Zar HJ, Workman L, Isaacs W, Dheda K, Zemanay W, Nicol MP. Rapid diagnosis of pulmonary tuberculosis in African children in a primary care setting by use of Xpert MTB/RIF on respiratory specimens: a prospective study. Lancet Glob Health. 2013 Aug;1(2):e97-104. doi: 10.1016/S2214-109X(13)70036-6. Epub 2013 Jul 24. Our studies are funded by several major international and national funders including the Bill & Melinda Gates foundation; National Institutes of Health (NIH); National Research Foundation (NRF); South African Medical Research Foundation (SAMRC); CRDF Global (Civilian Research & Development Foundation) and the National Institute for Communicable Diseases (NICD).